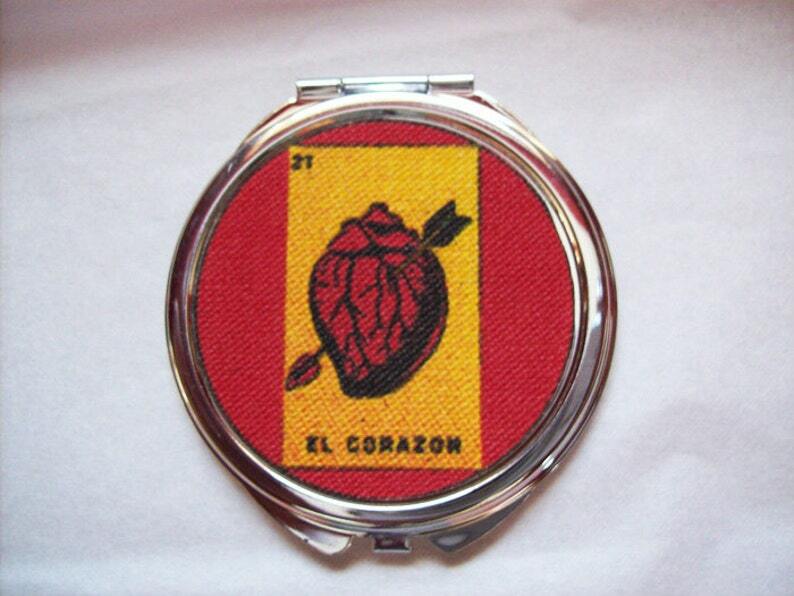 Add a little retro Mexico kitsch to your life with my groovy compact mirror featuring vintage era image from the wonderful Loteria. A great kitsch addition to any rockabilly handbag or purse. This little pocket mirror measures a little under 2.5" round and snaps open to reveal two mirrors, one regular and one magnifying. This item listing is for one mirror only and you may select either "El Corazon" or "La Luna" from the style drop down menu. I fabricate these by transferring the image onto lightweight canvas. I add a coat of scotch guard and adhere to a brand new compact. Love this mirror. :) I play this game all the time with family. :) Thanks. :) Great quality and sturdy . Bought for a friend's birthday. She loved it!